Spurgeon was known as the 'Prince of Preachers' and while it's not hard to see why people should focus on this area of Spurgeon's life and ministry, he wasn't only a preacher. He was involved in an extraordinarily wide range of Christian social activity. Who was the real man behind the headlines? What was his prayer life like and what was his attitude to the Bible? Did he have weaknesses and how were these overcome? As we read of the life of Spurgeon so also all these questions are explored in Peter Morden's fascinating and informative book, illustrated in full colour and published alongside the film of the same name. To help the reader to discover more of what we can learn from Spurgeon and about him, and ultimately the Lord Jesus, ^there are sections at the end of each chapter to challenge and encourage. 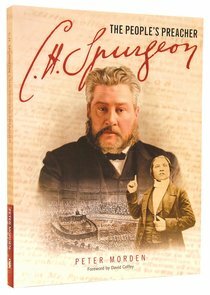 About "Spurgeon: The People's Preacher"
Peter J. Morden is Vice-Principal of Spurgeon's College, London, and teaches Church History and Spirituality.